Many of us love to dress in vintage clothes, I know I love it! It just feels so good to wear and it compliments a women's figure in ways I personally think modern clothing doesn't. But there are also many who love to add just a dash of vintage into their life without overwhelming their look with the past. I like to call that style of dressing...Vintagey. Vintagey to me isn't vintage or retro or pinup or anything of that sort. It is simply just adding pieces to your wardrobe or outfit of the day that gives the feeling of being vintage. For example like wearing Peter Pan Collars like I did HERE or wearing a 1950's styled skirt like I did HERE. 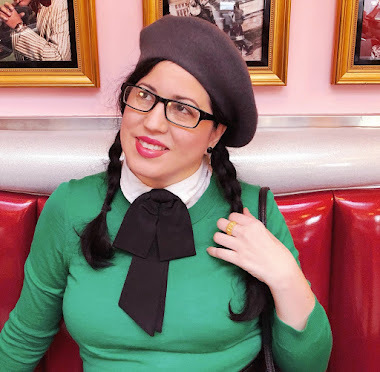 Depending on our lifestyles, our work situations, and our budgets, dressing Vintagey can be easily attainable if you know where to look and where to shop. The best part is, is that you can look vintage without literally wearing vintage. It can be subtle like just wearing a vintage styled top or you can wear a pretty vintage inspired dress. I love dresses so I will share with you a few Vintagey dresses that I find just delightful. Boden has a lot of 1950's/1960's styled dresses, blouses, sweaters, and bottoms. It can be a little pricey but I can say the quality is outstanding and you do get what you pay for. You can also check daily for sales as well as search via Ebay for second hand pieces or even new pieces that are being sold cheaply due to overstock. eShakti is constantly changing their merchandise from amazing dresses to even more amazing dresses. They also sell tops, skirts, and blazers. They often have a buy two get one free sale and other sales too. They offer a coupon if you sign up to their site as well. The neat thing about eShakti is that you can customize your dress by changed the sleeve or the length. That's pretty neat I think! I love the quality of their products and love even more that their dresses and skirts have pockets!! Modcloth has so many goodies from dresses to separates to housewares. I have had a good experience purchasing accessories from them like a few belts but I haven't purchased any dresses yet. They are all so amazing though. It would be hard to choose one! My final place to shop would have to be Ruche. A lot of their pieces are very whimsical and sort of romantic with lace and sheer materials but they do offer some Vintagey dresses and tops that are well priced. I love looking through their website because everything is so pretty and feminine. I am sure many of you know of these shops already but these are shops that I have purchased items from personally and can vouch for their quality and service. I will not recommend something unless I think it is worth recommending. Have you tried blending modern pieces with vintage pieces? Has it worked for you? Do you gravitate towards Vintagey pieces for your everyday look and keep the vintage for extra special occasions? I tend to wear my vintage dresses for school and things like that. I have more formal vintage pieces and casual looks. I really love the mod look and thankfully that's big this spring. You posted some great vintage inspired dresses. It doesn't always have to be authentic, it's all about the look.